First things first, the Annapurna Circuit Trek falls among the best destinations in the Great Himalaya Trail that offer you a chance to walk along some of the best trekking trails in the world. And if you are seeking to venture into the Annapurna massif you can expect to be wonderstruck by the stunningly beautiful experience this destination offers. Nested in the central Himalayan region of Nepal in the lap of Mount Annapurna (8,091 meters), the trail passes through two river valleys and massifs in the region including the fabled kingdoms of Manang and Mustang. And that is not all that can overwhelm you, not at all. Stunning 360° views of mountains and peaks rising above the elevation of 6000 m to 8000 m, a hike above the worlds’ deepest gorge in the valley of Kali Gandaki river, snow-capped mountains, lush green forests and warming welcome of many ethnic communities make the circuit trek, a satisfying destination in Nepal. 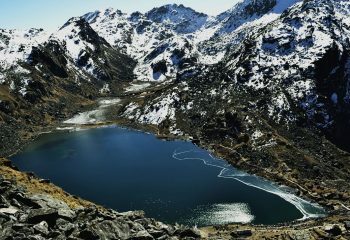 Although the trekking routes are open throughout the year, September to December and March to May are the best months to travel considering weather and travel easiness. Throughout October to November, the region is vibrant and with the passage of monsoon, life in the area is refreshed with clear skies and comfortable temperature, ideal for a trekking experience. Likewise, trekking in March to May is much encouraged as summer offers clearest views during the season. Much snow would already be dissipated only to cap the peaks and not to cover trails. 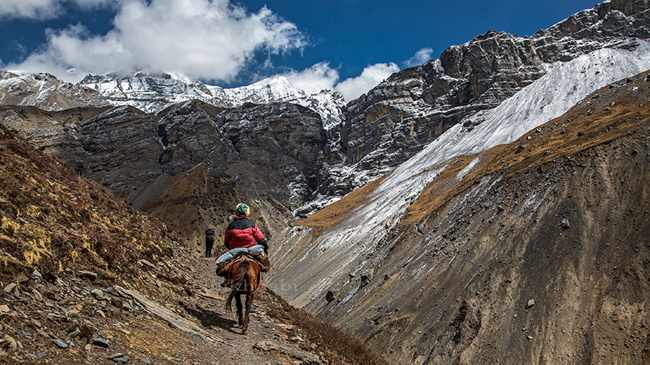 The arduous Annapurna trek does not require an enthusiast to be super strong. Nonetheless, you are advised to undertake basic cardio exercises and long-distance-walking for a month or two before you begin your trip. For most part of the trip, you will walk 6-7 hours with ample rest in between and few hard days require you hike up for 12 hours depending on your acclimatisation plans and guides’ itinerary. 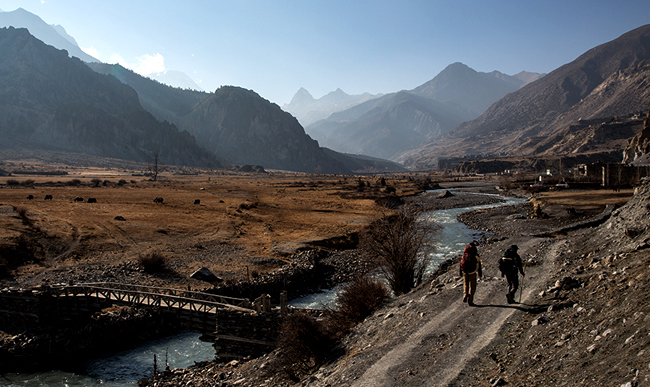 Daunting as it may sound, Annapurna Trek calls for a tough journey up the remote Himalayan region. However, remote doesn’t mean you will not get a decent accommodation, as the trail is walked on by many travelers, there are plenty of guest houses and home stays offering basic but cozy accommodation. Rooms are available in a twin share basis and can also be arranged for a single hiker with slight increase in cost. But most of the guest houses in high altitudes may not have single rooms. To avert cold, most of the teahouses have common fireplace where you will spend time resting, eating and meeting other travelers. 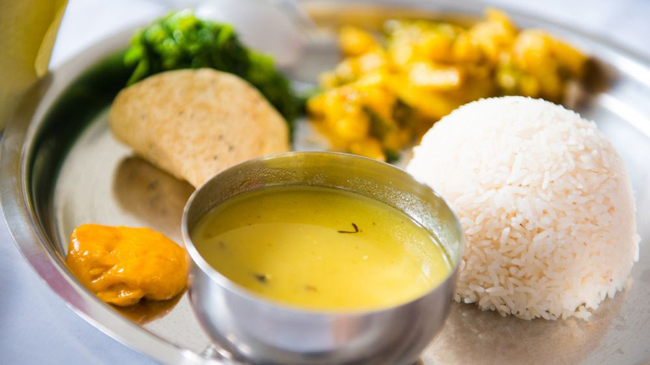 And the food, rest assured you would be talking about the food that Nepali ethnic communities offer for long. You can always order typical Masu (Meat) and Bhat (Rice) or go vegan, if you prefer. The guest houses offer more than decent food in their menus to let you eat by your freedom of choice. What about a quick insta or facebook post? Internet and telephone services are there to avail in all of the stops you will make each day throughout the journey. So, you will be able to call back home or drop cool posts every day. And if the solar panels fail, it won’t do you harm to let yourself be with you for a day or two, would it? If you are planning to trek the Annapurna circuit either alone or in a group, we recommend you reach out to a trekking agency that will facilitate you with a local guide and porter. 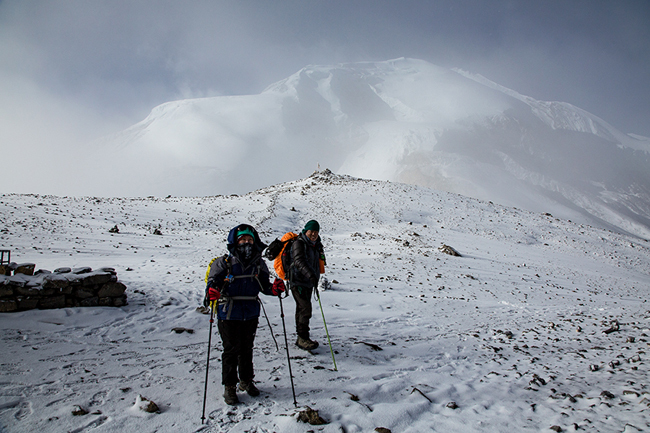 As the qualified guides and porters can help you assess routes, set up a pace and spot signs of altitude sickness, you would have a squad you can rely on. Moreover, the agency through which you book the trip will also make necessary arrangements such as local permits, accommodation and food. After all, you wouldn’t want to be responsible for everything from accommodation, itinerary to dealing with local authorities when you should be just sightseeing and trekking around, would you? Altitude sickness is real up there. As you wander higher than an elevation of 3000 m your body is exposed to low amounts of oxygen resulting into altitude sickness. And no matter how fit you are, if you donot abide by the rules of ideal trekking in the mountains, you might have to regret it later. 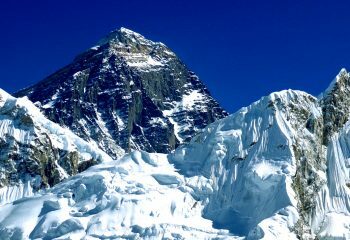 To avoid mountain sickness and all the risks and hassles it brings, you should remember to- stay hydrated, maintain a recommended pace, get adequate rest and carry prescribed medications if you wish, follow the acclimatization route and don’t rush when you are short of breath, winded or light headed. If you feel severe uneasiness followed by headache and nausea, let your guide know immediately. 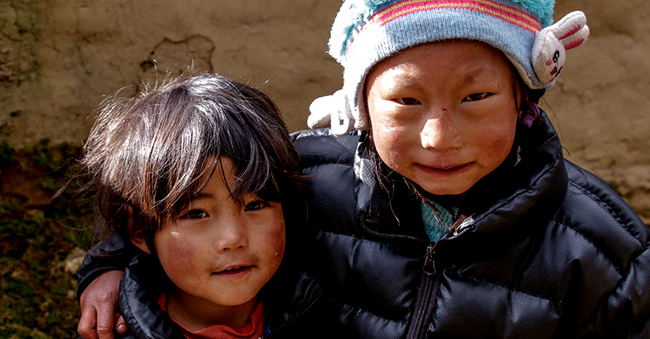 Make sure that you take a travel insurance at home before getting on the plane to Nepal. It is mandatory and you cannot take it here. The travel insurance will cover any and all emergency rescue and evacuations, if necessary. And also inform the trek agency about any medical condition that might affect your trip and carry medication prescribed by your doctor at all times. As for the insurance plans, your local agent will know which insurance plan will best suit your travel. You can obtain a visa at your home country through Nepal’s embassy or consular office. But you can easily get a visa upon arrival at Tribhuvan International Airport in Kathmandu. You just need two passport-size photographs. A tourist visa with multiple entries for 30 days costs $40 while the same for 90 days costs $100. And remember to carry a copy of your travel insurance and additional photographs. 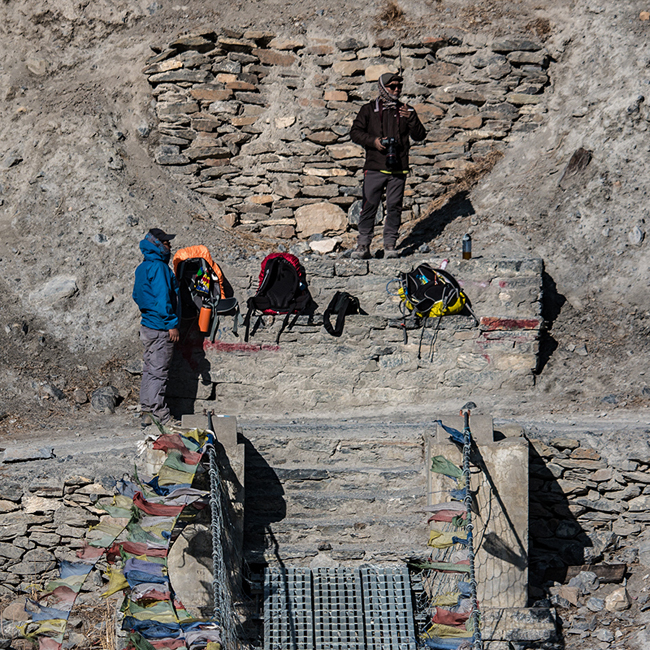 As for tourist fees and permits, your trek agency will make all the necessary arrangements. You can either pack all equipment, clothing and trek gears and land in Kathmandu or you can buy or rent all here. You will need clothing and gloves, in pairs, to keep you warm and glacier glasses with side shields and UV protection. Also carry rain jackets, hoods, trekking pants, waterproof light trekking boots, necessary medications for first aid and emergencies. As for gears, a trekking pole to take the stress off your knees would be sufficient. And lastly, build up some good vibes and get on trekking as you will come out more than content from this experience. Good luck! Happy trekking! This entry was posted on Sunday, January 13th, 2019 at 10:33 pm and is filed under Adventure, Essentials, Travel. feed.